What motivates someone to buy from you rather a competitor? If you asked 10 people you’d get 10 different answers, because they’re making unconscious judgements about your business all the time. Many studies today show that the consumer is more than halfway through their buying process before they reach out to a company. This means that brand awareness, SEO, reviews, testimonials, blog posts, social media, promos, and the company website are keys in the buying process because consumers will have already done all their research and are nearly committed to the purchase when they finally make contact with a business. How to make your website a positive influence! Add value – Buyers want products and services that add value. They want to feel like their purchase will enrich their lives in some way, helping them to reach a goal. Takeaway: don’t just sell branded pens. Sell a marketing solution that’s going to help their business grow sales! It might amount to the same thing but the approach is very different. Make it pleasurable – I don’t know about you, but there’s nothing better than a Snickers after a long day of errands, which is why I appreciate that grocery stores put all the candy bars and magazines by the checkout lines! They’re tapping into a desire to disengage from work and relax. Takeaway: put your most popular products on the home page of your website with an easy ‘add to basket’ option; add Live Chat so you can provide help while people browse; offer customer log in so that they can easily make repeat purchases without having to complete all of their details again. Social influence – Consumers trust and value the opinions of the people closest to them. In many cases the friends and family’s opinions have a greater influence when making a purchase than the consumer’s own. Consumers love personal recommendations and rely on them more than reviews or general Google searches. Takeaway: add testimonials and case studies to your website. Don’t tuck them away, either; a great place to see them is just close to the ‘buy now’ button. Takeaway: have a clear returns policy, and treat your customers as you would wish to be treated. Two ways of increasing sales and gaining more customers are attracting new consumers to the industry or poaching consumers from a competitor. In almost every case it is easier and less costly to retain an existing customer than to poach a completely new customer. The only industry that doesn’t seem to understand this complicated thought is the cell phone service providers. Verizon, AT&T, Sprint, and T-Mobile spend crazy amounts of money trying to poach competitors’ customers with aggressive marketing campaigns and an abundance of promotions. This money would be better spent focusing on satisfying their current customers. First time buyers can supply a wealth of sales and revenue for a business. They are looking to purchase, but will require a lot of help when going through the purchase process. The main thing these new consumers will be seeking is information and knowledge so they can make an informed decision about the right product for their needs. It’s important to provide detailed benefits about the different options, but don’t forget to tell them about any drawbacks of using, for example, a cheaper item over a branded market leader. The next step and the most difficult step is getting past the insecurities that these new consumers will have. They will be very reluctant to commit to the purchase if their insecurities are not addressed and dealt with. You probably already know what these objections will be, so be prepared with examples of why your recommendation will work for them. The last step is to provide some post-purchase support that will help them answer any questions they may have after the initial purchase day. This also minimizes customers getting upset and it also allows the business to generate more future sales from that same customer. Ultimately turning the new consumer into a veteran repeat customer is the end goal. Veteran consumers are very knowledgeable about the industry and the products or services in it. They are most likely going to approach a new company because they are unhappy with the previous company they did business with, or maybe they just want to try someone new. If these consumers have come to you because of a past problem, the first step is to acknowledge the problem to better understand what went wrong. Even if you don’t have an immediate solution, the key is to recognize and address the problem. This builds a connection and will unlock useful information that can be used to capture the sale. If you have the solution, then it will be an easy sale, but if you don’t, the next step would be to discuss future improvements and upgrades that may entice the consumer. Explaining where the company is heading can sometimes be the difference between making a sale and not. The final step would be to provide comparisons between your business and the past problematic company. This can be achieved by providing a complete list of advantages and disadvantages for the product or service. By telling consumers exactly what they will be getting prevents consumer dissatisfaction and makes it easier for them to part with their hard-earned money. It also gives you a chance to upsell if an item with the advantages the consumer is seeking is more expensive or they are trying to avoid some of the disadvantages that come with the cheaper item. Understand the consumer psychology and what drives consumers to make the purchases they do is time-consuming, but profitable. Your business needs to make sure it is using the right approach, capitalizing on hidden desires and fears, in order to make sales happen. Providing the right information and resources are keys in winning these customers and their hard-earned dollars. 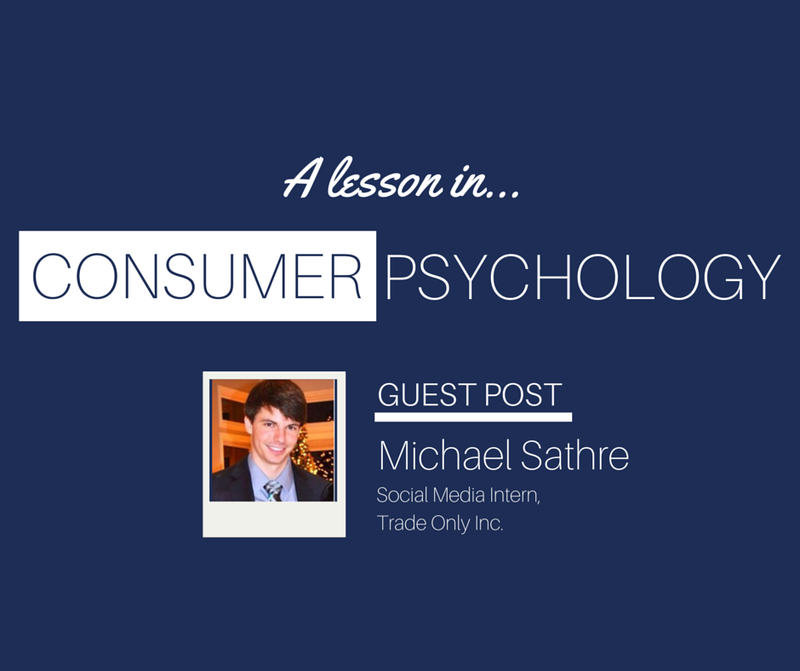 Michael Sathre is the Social Media Intern at Trade Only Inc. He contributes to the daily social media scheduling, dabbles in blogging, and assists the Director of Digital Marketing in leveraging SEO and analytics to create a brilliant marketing strategy. Michael is a recent graduate from Call State Fullerton with a BA in Marketing. He has held a handful of marketing consultant positions for firms in the orange county area. Michael’s skills include: Google Adwords, social media, blogging, market research, and data analysis.